The company was founded in 1930. The company's original name, American Machine and Metals, was changed to AMETEK in the early 1960s, reflecting AME's evolution from a provider of heavy machinery to a manufacturer of analytical instruments, precision components and specialty materials. Ametek today consists of two major groups (the Electronic Instruments Group and the Electromechanical Group). Together, these two groups and their respective divisions combine a total of over 100 brands, including analytical instruments, monitoring, testing and calibration devices as well as electrical motors, pumps and interconnects. The company's headquarters are in Berwyn, Pennsylvania. AMETEK is listed on the New York Stock Exchange. The common stock of AMETEK is a component of the S&P 400 index and the Russell 1000 Growth Index. AMETEK's Corporate Growth Plan is founded on four key strategies: Operational Excellence, Strategic Acquisitions & Alliances, Global & Market Expansion, and New Products. During the 1980s, one AMETEK group partnered with the California Institute of Technology to assemble hypercube topology computers. It is not known how many systems were delivered, but the market came to be dominated by Intel, NCUBE, and Floating Point Systems. AMETEK, Inc. acquired Southern Aeroparts, Inc. ("SAI"), a Tulsa, OK-based provider of third-party maintenance, repair and overhaul (MRO) services to the commercial aerospace industry On December 13, 2006. On Jan 20, 2009 Ametek acquired High Standard Aviation, a Miami-based provider of electrical/electromechanical, hydraulic and pneumatic repair services to the aerospace industry. On Sep 28, 2009 Ametek acquired the assets of Unispec Marketing Pvt. Ltd. and Thelsha Technical Services Pvt. Ltd., two privately owned and affiliated businesses headquartered in Mumbai, India. On Dec 2, 2009 Ametek acquired the pressurized gas systems business of Ameron Global, Inc., a privately held company based in Baldwin Park, CA. On Jan 26, 2010 Ametek acquired the assets of Sterling Ultra Precision, a privately held reseller of machine tools for the ophthalmic lens market. On April 8, 2010 Ametek acquired Imago Scientific Instruments, a privately held manufacturer of 3D atom probes, based in Madison, WI. On June 1, 2010 Ametek acquired Technical Services for Electronics (TSE), a privately held manufacturer of engineered interconnect solutions for the medical device industry. On July 1, 2010 Ametek acquired Haydon Enterprises, a manufacturer of high-precision motion control products, from the Harbour Group, a private, St. Louis-based operating company. On Aug 19, 2010 Ametek acquired assets comprising substantially all of American Reliance's Power Division (AMREL Power), a provider of specialty direct current (DC) power supplies and electronic loads for the automated test equipment market. On Nov 9, 2010 Ametek acquired Atlas Material Testing Technology LLC, a provider of weathering test instruments and related testing and consulting services, from Industrial Growth Partners. On April 28, 2011 Ametek acquired Avicenna Technology, Inc., a privately held supplier of custom, fine-featured components used in the medical device industry. Avicenna Technology with its headquarters and manufacturing operations in Montevideo, MN. On May 9, 2011 Ametek acquired Coining Holding Company, a supplier of custom-shaped metal preforms, microstampings and bonding wire solutions for interconnect applications in microelectronics packaging and assembly. On Oct 17, 2011 Ametek acquired Reichert Technologies, a privately held manufacturer of analytical instruments and diagnostic devices for the eye-care market headquartered in Depew, NY. On Oct 25, 2011 Ametek acquired the parent company of EM Test (Switzerland) GmbH, a privately held manufacturer of electronic test and measurement equipment headquartered in Reinach, Switzerland. On Jan 3, 2012 Ametek acquired Technical Manufacturing Corporation (TMC), a maker of high-performance vibration isolation systems and optical test benches used to isolate highly sensitive instruments for the microelectronics, life sciences, photonics and ultra-precision manufacturing industries. On Jan 26, 2012 Ametek acquired O'Brien Corporation, a manufacturer of fluid and gas handling solutions, sample conditioning equipment and process analyzers from Industrial Growth Partners. On May 21, 2012 Ametek completed the previously announced acquisition of the parent company of Dunkermotoren GmbH, a manufacturer of advanced motion-control solutions for a wide range of industrial automation applications. On Oct 23, 2012 Ametek acquired Micro-Poise Measurement Systems, a provider of integrated test and measurement solutions for the tire industry, from American Industrial Partners. On Dec 17, 2012 Ametek acquired Aero Components International (ACI) and Avtech Avionics and Instruments (Avtech), both privately owned, FAA-certified aviation repair operations located in Miami, FL. 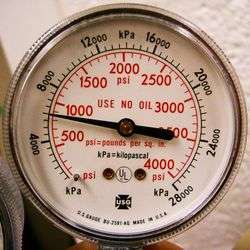 Crystal Engineering, a privately held manufacturer of high-end, portable pressure calibrators and digital test gauges for the oil and gas, power generation and other industrial markets. On Aug 7, 2013 Ametek acquired Controls Southeast, Inc. (CSI), a manufacturer of custom-engineered thermal solutions, from Industrial Growth Partners for approximately $160 million. CSI is based near Charlotte, NC. On Oct 29, 2013 Ametek acquired Creaform (3D), a developer and manufacturer of portable 3D measurement technologies and a provider of 3D engineering services for approximately $120 million. Based near Québec City, Canada, the privately held company has annual sales of approximately $52 million. On Dec 4, 2013 Ametek acquired Powervar, a provider of power management systems and uninterruptible power supply (UPS) systems, for approximately $128 million. Headquartered in Waukegan, IL, the privately held company has annual sales of approximately $70 million. On Jan 3, 2014 Ametek acquired Teseq Group, a manufacturer of test and measurement instrumentation for electromagnetic compatibility (EMC) testing, for CHF 83 million ($92 million). Headquartered in Luterbach, Switzerland, the privately held company has annual sales of approximately CHF 48 million ($53 million). On Feb 10, 2014 Ametek acquired VTI Instruments, a manufacturer of high precision test and measurement instrumentation for $74 million. VTI, acquired from an investor group led by Merit Capital Partners and Alerion Capital Group, has annual sales of approximately $38 million. On June 20, 2014 Ametek announced that it had completed its acquisition of Zygo Corporation (NASDAQ: ZIGO) for $19.25 per share in cash per fully diluted common share, or approximately $280 million net of cash acquired. On Aug 5, 2014 Ametek announced that it had completed its acquisition of AMPTEK, Inc., a privately held provider of x-ray detectors used to identify the composition of materials using x-ray fluorescence (XRF) within the metal, environmental monitoring, petrochemical, semiconductor and research markets. On Aug 5, 2014 Ametek announced that it had completed its acquisition of Luphos GmbH, a firm which produces non-contact metrology technology used in the measurement of complex aspherical lenses and optical surfaces. According to the company, Ametek made two significant acquisitions through the 3Q 2015. Ametek acquired Global Tubes, a manufacturer of high-precision, small-diameter metal tubing produced from stainless steel, nickel alloys, zirconium alloys and titanium for the aerospace, medical, nuclear, and oil and gas markets, on May 8, 2015. Annual sales for the acquisition total approximately US$120 million. Global Tubes comprises two business units: Superior Tube, based in Collegeville, PA, USA and Fine Tubes, headquartered in Plymouth, UK. On July 7, 2015, Ametek announced that it had completed the acquisition of the Surface Inspection Systems Division (SISD) of Cognex Corporation. The SISD unit has annual sales of approximately US$60 million. SISD develops and manufactures software-enabled vision systems used to detect flaws and defects in the surfaces of continuously processed materials. According to the company, SISD equipment uses proprietary, high-speed technology to detect, classify and accurately map defects across an entire surface area. ↑ "Management Team". Retrieved 2015-11-07. 1 2 3 4 5 6 7 8 "AMETEK INC/ 2013 Annual Report Form (10-K)" (XBRL). United States Securities and Exchange Commission. February 26, 2014. 1 2 "AMETEK INC/ 2014 Q1 Quarterly Report Form (10-Q)" (XBRL). United States Securities and Exchange Commission. May 6, 2014. ↑ "Archived copy". Archived from the original on 2013-01-26. Retrieved 2013-01-29. ↑ "Profile: Ametek Inc (AME)". Reuters. ↑ "Archived copy". Archived from the original on 2013-02-01. Retrieved 2013-01-29. ↑ "AMETEK Acquires Southern Aeroparts, Inc.". ↑ "Ametek acquires Global Tubes". 1 2 The Street Archived December 8, 2015, at the Wayback Machine. ↑ "Ametek completes SISD acquisition".